Who sharply wrote with a reed against error. Saint Proterius lived in Alexandria during the patriarchal tenure of Dioscorus (444-451), an adherent of the Monophysite heresy of Eutyches. Proterios fearlessly denounced the heretics and confessed the Orthodox faith. However, many supporters of Dioscorus remained in Alexandria. Rebelling against the election of Proterios, they rioted and burned the soldiers who were sent out to pacify them. The factious party was headed by two vicious ecclesiastics, Timothy, surnamed Aelurus, and Peter Mongus, whom the Saint had canonically excommunicated. The pious emperor Marcian (450-457) deprived the Alexandrians of all the privileges they were accustomed to, and sent new and reinforced detachments of soldiers. The inhabitants of the city then quieted down and begged Patriarch Proterios to intercede with the emperor to restore their former privileges to them. The kindly Saint consented and readily obtained their request. After the death of Marcian the heretics again raised their heads. At the absence of the prefect of the city, Timothy Aelurus, having caused himself to be ordained by two bishops of his faction, who had been formerly deposed, took possession of the episcopal throne, and was proclaimed by his party the sole lawful Patriarch of Alexandria. 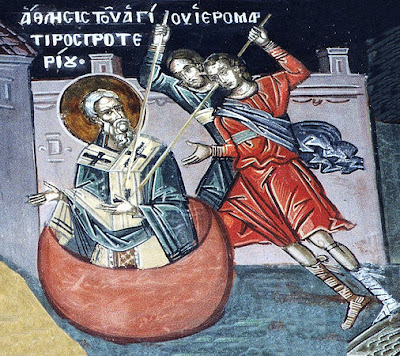 But being soon after driven out of the city by the imperial commander, this so inflamed the Eutychian party, that their barefaced attempts obliged Saint Proterios to leave Alexandria, but that night he saw in a dream the holy Prophet Isaiah, who said to him, “Return to the city, I am waiting to take you.” The Saint realized that this was a prediction of his martyric end. He returned to Alexandria and concealed himself in a baptistry. The insolent heretics broke into this refuge and killed the Patriarch and six men who were with him. They did this by driving a sharp reed through his inwards parts, then they maniacally devoured his inward parts like wild animals. The fact that it was Holy Saturday did not stop them. In their insane hatred they tied a rope to the body of the murdered Patriarch, and dragged it through the streets. They beat and lacerated it, and finally they burned half of it, scattering the ashes to the wind, while the other half of his body they threw to the dogs. The Orthodox reported this to the holy Emperor Leo (457-474) and Saint Anatolios, Patriarch of Constantinople (July 3). An army arrived at Alexandria, the rebellion was crushed, and Timothy Aelurus was brought to trial and exiled. * The accession of Proterios marks the beginning of the Schism of 451 between what later became known as the Coptic Orthodox and the Greek Orthodox patriarchs of Alexandria, which has never been completely resolved. Because the Church of Alexandria was largely anti-Chalcedonian, the deposition of Dioscorus, a anti-Chalcedonian, from the Patriarchate, and the elevation of Proterios, a Chalcedonian, to it, was violently opposed. Finally in 457 the anti-Chalcedonian party in Alexandria elected Timothy Aelurus as Patriarch of Alexandria, in opposition to Proterios, who was subsequently martyred by Coptic mobs. Proterios is regarded as a Saint by the Eastern Orthodox Church. He is not recognized as a Pope by the Coptic Orthodox, who instead recognize Dioscorus and Timothy as having been the legitimate Popes during this time.